This post was originally shared on my Patreon on March 15, 2019. 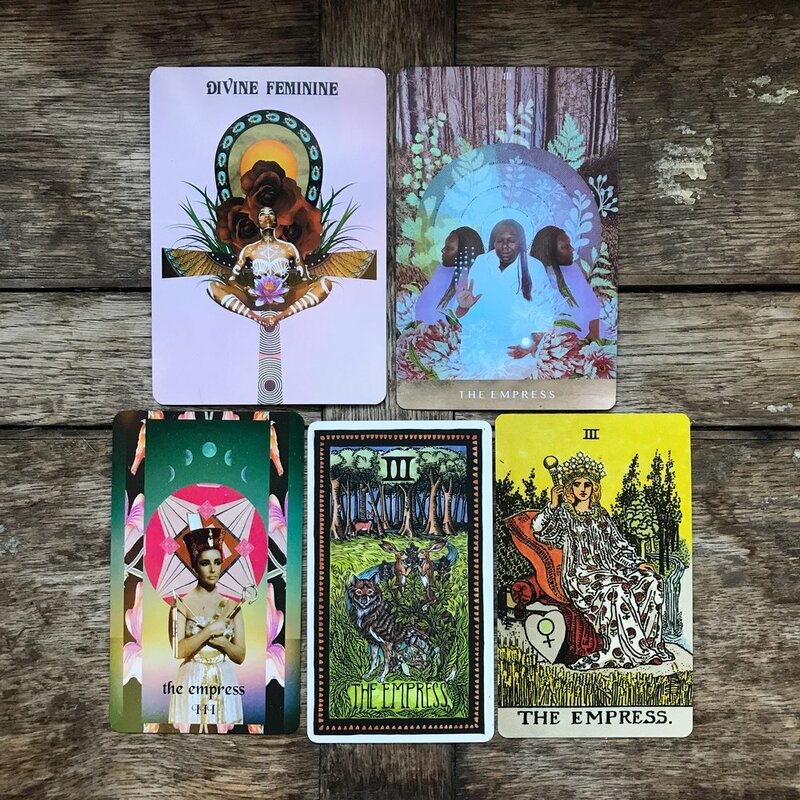 If you’d like early access to posts like these and access to Patreon-only content — such as deeper dives into tarot & astrology, monthly open conversations, and quarterly drawings for free readings — consider joining me there. Struggling with a particular card in the tarot can be a unique form of frustrating. Others seem to just “get” it, but no matter how many times you refer to the guidebook or google for alternate interpretations, it still doesn’t click. When this happens, it’s time to look beyond the card, beyond the standard definitions, beyond the queer reinterpretations. It’s time to look at your relationship to that archetype. Remember that tarot cards are windows into archetype, stained glass depictions of thought-forms so massive and so ancient they’re nearly impossible to define. they swirl in the deep, unconscious soup that is progenitor to meaning, myth, belief, culture. Archetypes are chaotic neutral, unblank slates upon which we foist our ethics, our morals, our fears, our failures. Struggling with a tarot card is a sign of struggling to find the nourishment available within that archetype. Negative experiences of the archetype, especially in early childhood. A culture that promotes a vapid perspective, devoid of magic but full of -isms. Lack of personal experience with relevant archetypal themes. So then how do we stop struggling? By continuing to search for a version of that archetype that opens the door to comprehension. By addressing internalized-but-untrue patriarchy, supremacy, capitalism, worth-narratives, sexism, repression. By dreaming. By frolicking with fairy tales. By reclaiming and strengthening intuition. By refusing to let one smudged archetype-facet ruin the whole jewel. Take the Empress, for example. She is the quintessence of the divine feminine, the all-mother, Earth incarnate as human, nurturer at levels so profound we cannot fully comprehend them. If your own mother neglected you, abused you, malnourished you, abandoned you physically or emotionally, filled you with acrid bile instead of sweet milk, failed you failed you failed you — why, of course your concept of Mother is soured, of course the Empress is confusion and hurt. If you exist in or beyond the range of gender between “man” and “woman,” the heavy womanliness, the tinges of “biology as destiny,” and the lazy assumption that woman = mother = uterus renders the Empress an oppressor, an unsafe and unchosen family. If you carry an unseen and unexamined misogyny, internalized from wider culture, the depth and power of the Empress will elude you until you repair your disdain of the feminine. If you have yet to sort out the fact that feminine =/= woman and masculine =/= man, that all of us, regardless of gender, carry both with us always, that feminine and masculine operate far beyond sexual politics, that the versions of “feminine” and “masculine” you’ve been conditioned into are mere holograms of their true depths, the mysteries of the Empress will elude you. top row from left to right: SheWolfe Tarot, Moonchild Tarot. bottom row: Serpentfire Tarot, Brady Tarot, Smith-Waite borderless. The Empress is in and of and for everyone. The Empress loves. The Empress is a fecund prosperity that goes far beyond procreation. The Empress is gravity and granite and the glitter of winter sun on snow. The Empress tends the umbilical cord between us and anything and everything that is ours to bring forth into the world: children, poems, breakfasts, shower songs, lqqks, zines, paintings, elaborate cuss words. She wants you to eat well, sleep well, love well. She wants you safe enough to thrive but not so safe that you fall into complacency. She wants you to wear what makes you feel good. She wants you to find not just happiness, but joy. The Empress, like any tarot archetype, can be a struggle. When an archetype is challenging, it’s an indicator of healing to be done, of toxic concepts to be discarded. What a challenging archetype is NOT is an indication of your failure, of tarot’s failure, or of the failure of someone else's interpretations. Take the time to dig in towards a truth that goes deeper than any immediate revulsions or salty feelings; there’s a wealth of insight available beyond your apprehension. Interested in exploring a particular archetype more deeply? Consider booking a one-on-one tarot session to investigate what’s beneath the challenge. Sign up to receive a FREE downloadable cheat sheet to the tarot arcana! You’ll also receive occasional news, updates, & other goodies.